This article is about the general form of bagpipes. For specific types of bagpipe, see List of bagpipes. Bagpipes are a woodwind instrument using enclosed reeds fed from a constant reservoir of air in the form of a bag. The Scottish Great Highland bagpipes are the best known in the Anglophone world; however, bagpipes have been played for a millennium or more throughout large parts of Europe, northern Africa, and western Asia, including Turkey, the Caucasus, and around the Persian Gulf. The term bagpipe is equally correct in the singular or plural, though pipers usually refer to the bagpipes as "the pipes", "a set of pipes" or "a stand of pipes". An adaptation of the "Skye Boat Song" for Great Highland bagpipes played by the Clan Stewart Pipe Band. A set of bagpipes minimally consists of an air supply, a bag, a chanter, and usually at least one drone. Many bagpipes have more than one drone (and, sometimes, more than one chanter) in various combinations, held in place in stocks—sockets that fasten the various pipes to the bag. The most common method of supplying air to the bag is through blowing into a blowpipe or blowstick. In some pipes the player must cover the tip of the blowpipe with their tongue while inhaling, but most blowpipes have a non-return valve that eliminates this need. In recent times, there are many instruments that assist in creating a clean air flow to the pipes and assist the collection of condensation. An innovation, dating from the 16th or 17th century, is the use of a bellows to supply air. In these pipes, sometimes called "cauld wind pipes", air is not heated or moistened by the player's breathing, so bellows-driven bagpipes can use more refined or delicate reeds. Such pipes include the Irish uilleann pipes; the border or Lowland pipes, Scottish smallpipes, Northumbrian smallpipes, pastoral pipes in Britain; and the musette de cour, the musette bechonnet and the cabrette in France, the Dudy wielkopolskie, koziol bialy and koziol czarny in Poland. The bag is an airtight reservoir that holds air and regulates its flow via arm pressure, allowing the player to maintain continuous even sound. The player keeps the bag inflated by blowing air into it through a blowpipe or pumping air into it with a bellows. Materials used for bags vary widely, but the most common are the skins of local animals such as goats, dogs, sheep, and cows. More recently, bags made of synthetic materials including Gore-Tex have become much more common. A drawback of the synthetic bag is the potential for fungal spores to colonise the bag because of a reduction in necessary cleaning, with the associated danger of lung infection. An advantage of a synthetic bag is that it has a zip which allows the user to fit a more effective moisture trap to the inside of the bag. Bags cut from larger materials are usually saddle-stitched with an extra strip folded over the seam and stitched (for skin bags) or glued (for synthetic bags) to reduce leaks. Holes are then cut to accommodate the stocks. In the case of bags made from largely intact animal skins, the stocks are typically tied into the points where the limbs and the head joined the body of the whole animal, a construction technique common in Central Europe. The chanter is the melody pipe, played with two hands. Almost all bagpipes have at least one chanter; some pipes have two chanters, particularly those in North Africa, in the Balkans, and in Southwest Asia. A chanter can be bored internally so that the inside walls are parallel (or "cylindrical") for its full length, or it can be bored in a conical shape. The chanter is usually open-ended, so there is no easy way for the player to stop the pipe from sounding. Thus most bagpipes share a constant, legato sound where there are no rests in the music. Primarily because of this inability to stop playing, technical movements are used to break up notes and to create the illusion of articulation and accents. Because of their importance, these embellishments (or "ornaments") are often highly technical systems specific to each bagpipe, and take many years of study to master. A few bagpipes (such as the musette de cour, the uilleann pipes, the Northumbrian smallpipes, the piva and the left chanter of the surdelina) have closed ends or stop the end on the player's leg, so that when the player "closes" (covers all the holes) the chanter becomes silent. A practice chanter is a chanter without bag or drones, allowing a player to practice the instrument quietly and with no variables other than playing the chanter. The term chanter is derived from the Latin cantare, or "to sing", much like the modern French word chanteur. Bagpipes players from The City Of Auckland Pipe Band. Most bagpipes have at least one drone: a pipe which is generally not fingered but rather produces a constant harmonizing note throughout play (usually the tonic note of the chanter). Exceptions are generally those pipes which have a double-chanter instead. A drone is most commonly a cylindrically-bored tube with a single reed, although drones with double reeds exist. The drone is generally designed in two or more parts with a sliding joint so that the pitch of the drone can be adjusted. A baggepype wel coude he blowe and sowne, /And ther-with-al he broghte us out of towne. The International Bagpipe Festival (Mezinárodní dudácký festival, IBF, MDF) is held every two years in Strakonice, Czech Republic. A Canadian soldier plays the bagpipes during the War in Afghanistan. Bagpipes are frequently used during funerals and memorials, especially among fire department, military and police forces in the United Kingdom, Ireland, the Commonwealth realms, and the US. During the expansion of the British Empire, spearheaded by British military forces that included Highland regiments, the Scottish Great Highland bagpipe became well-known worldwide. This surge in popularity was boosted by large numbers of pipers trained for military service in World War I and World War II. The surge coincided with a decline in the popularity of many traditional forms of bagpipe throughout Europe, which began to be displaced by instruments from the classical tradition and later by gramophone and radio. 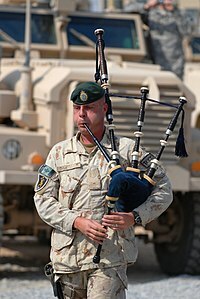 In the United Kingdom and Commonwealth Nations such as Canada, New Zealand and Australia the Great Highland bagpipe is commonly used in the military and is often played in formal ceremonies. Foreign militaries patterned after the British Army have also taken the Highland bagpipe into use including Uganda, Sudan, India, Pakistan, Sri Lanka, Jordan, and Oman. Many police and fire services in Scotland, Canada, Australia, New Zealand, Hong Kong, and the United States have also adopted the tradition of fielding pipe bands. In recent years, often driven by revivals of native folk music and dance, many types of bagpipes have enjoyed a resurgence in popularity and, in many cases, instruments that were on the brink of obscurity have become extremely popular. In Brittany, the Great Highland bagpipe and concept of the pipe band were appropriated to create a Breton interpretation, the bagad. The pipe band idiom has also been adopted and applied to the Galician gaita as well. Additionally, bagpipes have often been used in various films depicting moments from Scottish and Irish history; the film Braveheart and the theatrical show Riverdance have served to make the uilleann pipes more commonly known. Bagpipes are sometimes played at formal events in Commonwealth universities, particularly in Canada. Because of the Scottish influences on the sport of curling, bagpipes are also the official instrument of the World Curling Federation and are commonly played during a ceremonial procession of teams before major curling championships. Bagpipe making was once a craft that produced instruments in many distinctive local traditional styles. Today, the world's biggest producer of the instrument is Pakistan, where the industry was worth $6.8 million in 2010. In the late 20th century, various models of electronic bagpipes were invented. The first custom-built MIDI bagpipes were developed by the Asturian piper known as Hevia (José Ángel Hevia Velasco). Dozens of types of bagpipes today are widely spread across Europe and the Middle East, as well as through much of the former British Empire. The name bagpipe has almost become synonymous with its best-known form, the Great Highland bagpipe, overshadowing the great number and variety of traditional forms of bagpipe. Despite the decline of these other types of pipes over the last few centuries, in recent years many of these pipes have seen a resurgence or revival as musicians have sought them out; for example, the Irish piping tradition, which by the mid 20th century had declined to a handful of master players is today alive, well, and flourishing a situation similar to that of the Asturian gaita, the Galician gaita, the Portuguese gaita transmontana, the Aragonese gaita de boto, Northumbrian smallpipes, the Breton biniou, the Balkan gaida, the Romanian cimpoi, the Black Sea tulum, the Scottish smallpipes and pastoral pipes, as well as other varieties. Traditionally, one of the purposes of the bagpipe was to provide music for dancing. This has declined with the growth of dance bands, recordings, and the decline of traditional dance. In turn, this has led to many types of pipes developing a performance-led tradition, and indeed much modern music based on the dance music tradition played on bagpipes is no longer suitable for use as dance music. The Scottish Great Highland bagpipe played at a Canadian military function. A musician with a Northern Italian Baghèt wearing traditional dress. Modern Baghèt (made 2000 by Valter Biella) in G.
Central and southern Italian zampogna. Laz man from Turkey playing a tulum. Cillian Vallely playing Irish Uilleann pipes. Man from Skopje, Macedonia playing the Gaida. Sruti upanga, a Southern Indian bagpipe. Bagad of Lann Bihoué from the French Navy. Pastoral pipes with removable footjoint and bellows. Street piper from Sofia, Bulgaria. Syrian piper in Damascus, Syria. Various forms of the Tsampouna, found in the Greek islands. Man playing the bagpipe on Dam square. Background: Royal Palace of Amsterdam, Netherlands. Ľubomír Párička playing bagpipes, Slovak Republic. Since the 1960s, bagpipes have also made appearances in other forms of music, including rock, metal, jazz, hip-hop, punk, and classical music, for example with Paul McCartney's "Mull of Kintyre", AC/DC's "It's a Long Way to the Top (If You Wanna Rock 'n' Roll)", and Peter Maxwell Davies's composition An Orkney Wedding, with Sunrise. An Píobaire, Dublin: Na Píobairí Uilleann . Chanter, The Bagpipe Society . The Piping Times, Glasgow: The College of Piping . Piping Today, Glasgow: The National Piping Centre . Utriculus, Italy: Circolo della Zampogna . The Voice, Newark, DL: The Eastern United States Pipe Band Association . Baines, Anthony (Nov 1991), Woodwind Instruments and Their History, Dover Pub, ISBN 0-486-26885-3 . ——— (1995), Bagpipes (3rd ed. ), Pitt Rivers Museum, Univ. of Oxford, ISBN 0-902793-10-1 , 147 pp. with plates. Cheape, Hugh, The Book of the Bagpipe . Collinson, Francis (1975), The Bagpipe, The History of a Musical Instrument . ^ "Bagpipe warning over threat of fatal fungus – Health". The Scotsman. 2013-03-10. Retrieved 2013-08-21. ^ "Hybride jouant de la cornemuse". Sorbonne, Paris. 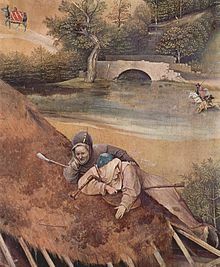 ^ "Cochon jouant de la cornemuse". Sorbonne, Paris. ^ J. E. A. Dawson, Scotland Re-Formed, 1488–1587 (Edinburgh: Edinburgh University Press, 2007), ISBN 0-7486-1455-9, p. 169. ^ J. Porter, "Introduction" in J. Porter, ed., Defining Strains: The Musical Life of Scots in the Seventeenth Century (Peter Lang, 2007), ISBN 3-03910-948-0, p. 35. ^ Abbas, Nosheen (2012-12-31). "The thriving bagpipe business of Pakistan". Pakistan: BBC News Online. Retrieved 2013-01-02. 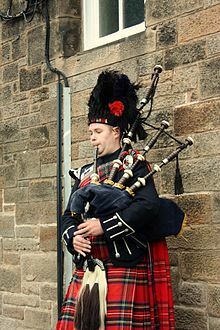 Wikimedia Commons has media related to Bagpipes. Wikisource has the text of the 1911 Encyclopædia Britannica article Bag-pipe. Bagpipe iconography – Paintings and images of the pipes. 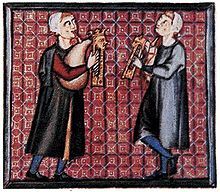 Musiconis Database of Medieval Musical Iconography: Bagpipe. Official site of Baghet (bagpipe from North Italy) players. Celtic Music : Scottish Military Bagpipes.